Bill & Lisa's Sporting Life: THE PINE NEEDLES COUPLES JAMBOREE: Bill and Lisa Team Up! THE PINE NEEDLES COUPLES JAMBOREE: Bill and Lisa Team Up! I enjoy playing golf with my wife! I particularly enjoy taking golf vacations with her. Traveling with Lisa affords certain amenities that are not available on buddy trips. Better yet is the opportunity to play with Lisa as my partner in mixed tournaments on golf vacations. We have competed in several mixed competitions on excursions to the U.K. and Ireland, but few are available in the U.S.
One notable exception is the "Pine Needles Couples Jamboree" annually held in early November at the adjacent Pine Needles Lodge and Mid Pines Inn resorts in Southern Pines, North Carolina- only four miles distant from golf mecca Pinehurst. The event is played over two of Donald Ross's many Sandhills masterpieces: Pine Needles- the site of multiple U.S. Womens' Opens, and Mid Pines- just across the road. The two resorts are owned and operated by the extended Bell family. 91 year old Peggy Kirk Bell is the matriarch of this remarkable clan, and for that matter, womens' golf! She is a pioneer member of the LPGA, having battled the likes of Babe Zaharias, Patty Berg, and Louis Suggs in that tour's earliest days. She then forged a renowned career as a teaching professional, and is still recognized as one of the top 100 teaching pros. 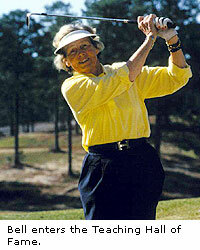 Mrs. Bell and her late husband, Warren "Bullet" Bell, bought the Pine Needles golf course in 1953. Even before Bullet Bell's death in 1984, Pine Needles was a family enterprise. Son Kirk and daughters Bonnie and Peggy joined their parents in the business. Sons-in-law Pat McGowan (Bonnie's husband) and Kelly Miller (Peggy's husband and Pine Needles' COO) also became integral parts of the operation. Pat, a successful PGA touring pro circa late 70's-mid 80's, now serves as Pine Needles "Director of Instruction." Pine Needles' golf school ( in particular its "Golfari" program for women) enjoys a national reputation. You will encounter all members of the extended Bell family in the course of a visit, but Mrs. Bell and McGowan provide an especially ubiquitous presence at the array of golfing events taking place at Pine Needles and neighboring Mid Pines, (acquired by the family in the 90's). Lisa and I arrived early Wednesday afternoon at Pine Needles, played a practice round, and checked in. We were delighted with our spacious wood-paneled accommodations on the top floor of the lodge overlooking the putting green. The welcoming cocktail party afforded us a chance to meet the other 13 couples. The Jamboree generally sports a larger field, but Hurricane "Sandy" which had recently smashed the eastern seaboard, caused many cancellations. We learned that a majority of the players have such a wonderful time that they count on coming back every year. The Moores from Maryland have competed in the Jamboree for over 30 years, and the Jones's from Sarasota have attended for almost as long a duration. As oft happens when you are thrown together with folks you don't know, I discovered connections with them. Bill Stemple worked in Hudson, Ohio- my hometown- and he was well-acquainted with several members of my family. Maureen Wegenek's deceased husband was the professional at Oak Knolls in Kent, Ohio, where I played golf as a schoolboy. The Albrechts hailed from Akron, very near where I grew up. I knew of the Albrecht name as it was the family that owned the foremost chain of supermarkets in the Akron environs. The cocktail party featured a fascinating assortment of card tricks from master magician Rick Allred. We did not overindulge in the alcoholic spirits, but it was comforting to know that the price of the entire event (5 rounds of golf apiece , lodging, all meals, lunch on the course, parties etc.) was all-inclusive. The convivial Pat McGowan welcomed us, introduced the contestants, and explained the tournament format. The first round was to be played at Mid Pines with a modified "shamble" format. Both players drive; the best drive is selected; both players play their own ball from that spot with the best score of the two players counting as the team score for that hole. No handicap strokes were to be allotted. However, after the first two rounds, the field would be divided into four divisions based on the teams' 36 hole scores. knee-slapping repartee between her and bemused son-in-law Pat. An example: Peggy remarked that if she ever "lost her marbles," the family should stick her in the cheapest nursing home possible since she "wouldn't know the difference." Pat immediately retorted, "Don't worry Mom, we will!" While I can't prove it, I suspect that Peggy and Pat may have performed that routine at previous events. The format for Friday's play at Pine Needles was modified alternate shot (i.e. the "divorce maker"). Both players hit from the tee. Each plays their partner's second shot. The team then selects the ball to be played and then the players hit alternately until the ball is holed. Our team struggled. Our poor play featured a four-putt! We returned an ugly 89 and while we did not discuss divorce, we plumetted down to the third of the four divisions. Several of the teams performed brilliantly; defending champions Ryal Lancaster and Mary Kozak broke par and led the championship with the final round remaining. The bright side of our tough day was getting to know our fellow competitors Ray and Rosemary Parlade from Daytona Beach and Jay and Judy Davis from Weeki Wachee, Florida. The two couples took Lisa and me under their wings on Friday, and in short order, we made great friends. There is no doubt that a shared passion for the game of golf leads to lasting friendships. Another highlight of Friday's events was the golf clinic featuring Pat, Mrs. Bell, and assistant pro Maggie Simons, a former Wake Forest golf team member, and two-time North Carolina amateur champion. Pat expertly worked practical advice into his shotmaking repertoire. He offered us an anti-flipping tip urging us to make sure the "little horse" (the symbol on a golf glove) arrives at the the ball before the "big horse" (the symbol on the grip). He demonstrated how differently the ball reacts when it is properly compressed as opposed to the glancing contact that characterizes way too many of our shots. With Pat explaining the process, Maggie demonstrated how to alter the flight of the ball with swing path and alignment. We were curious whether Mrs. Bell would make an appearance on the tee. But Pat helped the great lady from the cart, and while holding her arm, slowly escorted her to the tee. Pat handed her a 7 iron and teed one up. With a club in her hand, Peggy seemed to undergo a transformation. She addressed the ball with perfect posture and an immaculate grip. She demonstrated the proper way to make a waggle, and then self-assuredly whacked a couple solid shots. And yes, she did compress the ball! It was a cool moment! Day three was a better ball at scratch competition. Lisa and I managed a so-so 81- disappointing since I shot 74 on my own ball in a practice round. We did not win our division. Jim and Pattie Parsons emerged as the champions of the Jamboree with the Mooksang and Ewing-Chaney teams in hot pursuit. But that did not end the games. A putting contest with tricky obstacles followed. Flight winners and friends Jay and Judy Davis stroked their way to victory thereby adding to their booty. Then the Davis, Parlade, and Case teams headed for the Pine Needles four hole practice course for yet another game for prizes. The memorable moment was Ray Parlade's incredible escape from the pine straw on the third hole. This was a blind shot which required filtering a low punch-cut through the pine boughs and bracken. Ray did all that, and saw his ball take a sharp but controlled bounce to the right, ultimately bobbing up four feet from the hole. Ray promptly converted this unlikely bird. I photographed Ray's incredible second shot below. We played one final round at Mid Pines on our get-away day furthering international relations with Canadians Garland and Bonnie McLaren. The McLarens were great company and fine players (they were the winners in the four hole contest) . Lisa had a great time too, and insisted we sign up for the 2013 Jamboree. She is positive we can do better! Hope to see you there! Lisa- looking good at Pine Needles!